Spoonfed is an events listing website for London. Spoonfed lists event details, reviews by critics, artists, musicians and performers, and of course shows the location of events on Google Maps. Users of Spoonfed can define 'what' they are looking for and 'where'. The results are then returned on a Google Map. Events are tagged on the map with custom map markers that indicate whether the event is theatre, live music, comedy etc. The Liverpool Daily Post has produced a Google Map that lets readers explore the newspaper's stories geographically. This is obviously a great resource for anyone who wants to explore the news archive for a particular neighbourhood in Liverpool. The map makes good use of marker clustering and the marker for each story contains a link that will take you to the article's web page. The Times newspaper has produced this Google Map that shows Department for Transport data of all the road accidents in 2007 involving cyclists where injuries were reported to the police. The map is a detailed portrait of the UK’s cycling accidents. Zoom in and you can literally see the placemarks for individual accidents. Engaging Places is an initiative from CABE and English Heritage to help users find a local venue or organisation that provides educational programmes, resources, workshops, events or exhibitions. All the the locations are shown on a Google Map. This should prove to be an invaluable guide for teachers to find places to visit with their pupils. BarCrawl is a UK website designed to let drinkers organise a night out. The site uses Google Maps to let drinkers see all the pubs in an area. The site has also just released a new feature that lets users follow a bar crawl virtually in Google Maps Street View. For example, try out The King Street Run, a virtual bar crawl of five pubs in Cambridge. TripTrip is a website that allows travellers to create free journals of their journeys. Google Maps are used when creating a trip to select each location within a trip, and to build a map showing the route which a traveller took. Here is an example map of a journey to Finland and Russia. The site uses reverse address lookup to find the name of locations chosen by the traveller. The site also contains a handy tour on how to create your own travel journal. This is a mashup between Salesforce and Google Maps to show complementary therapy clinics in the UK. Results can be refined by type of clinic, type of client or by price. The map uses marker clustering. Green markers indicate that there is more than one clinic in a location. LondonFlatemate is a website dedicated to helping Londoners find a flat-share. 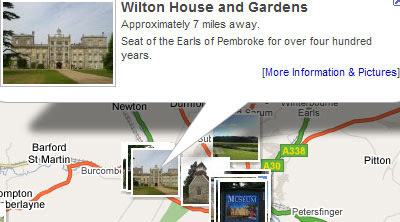 The site uses a handy Google Maps interface to show available flats. Each flat-share advert is shown on a Google Map so you can see exactly where the flat-share is. It is possible to use the map to determine how close places of interest are to a flat, how close the flat-share is to your current flat or how close it is to your work. This website allows car drivers to find parking spaces and garages in London and car park space and garage owners to rent out their space. The site uses a Google Maps interface to show where spaces are available and now uses Street View, so that car drivers can scope out the space virtually before letting a space. Picture the UK is a tourism site for the UK. It allows visitors to the UK to zoom in on the region they are visiting and view photographs of tourist attractions in that region. Clicking on the photographs opens an information window with a brief description of the attraction and a link to it's web page. This is an interesting way to play a trip to a UK region. The map allows the visitor to get a quick overview of any region's major attractions. 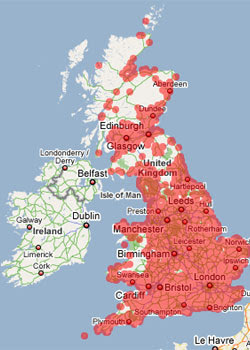 This is a nice collection linking to the Google Maps satellite image of every football ground in England and Scotland. What? No "Where Can I Live?"??? Where Can I Live has been featured before - despite not using Google Maps! UK Google Maps Mashup Round-up! Local Websites to Replace Newspapers?